Do you want to stay ahead of the competition by utilizing social media in 2019? Do you want to discover the best practices for marketing on each social media platform? Do you want to learn how to target your ideal customers? Social media isn’t as easy as putting a few posts on your Facebook page and watching as thousands like your page and buy your products/services. Instead, you need proven and up-to-date strategies for each platform. You need to market yourself on social media in a way that will actually give you the tangible results you desire and deserve. The modern marketing game is changing; you don’t want to be left behind, do you? The five must-know social media marketing strategies for 2019! Ten practical tips that can be implemented right away for every social media platform you need to be on! Even if you’ve never written out a Facebook status or posted a picture on Instagram before, this audiobook will still show you exactly how you can use social media to grow your brand and business to levels you never believed possible. Spends WAY too long on the basics (how to create accounts, upload cover photos, etc), but then speaks about more advanced concepts as though you're already an expert. Definitely skips over a lot of best practices. "This is how you upload a cover photo, and then you just implement your powerful social media marketing strategy and you're set!" (not a direct quote, but that's essentially the gist of each chapter). Now its time for me to take action! Very informative in terms of showing how social media is so essential to any marketing strategy in 2019. Has made me realize how much I have been neglecting this aspect of my business- thanks so much Gary and great narration from Michael look forward to the next few books! Opened my eyes to the possibilities! I was a bit skeptical at first when I bought this book but wow! This really is an amazing book. I found it super easy to follow and everything was explained in clear layman’s terms. There is a wealth of information including analytics on how to narrow your target audience to just the people who are interested in your product/services, which is especially useful for me with such a niche target market. With the information here, I’m confident i can get on Facebook and start generating Revenue for the products that I sell, something I was so scared of doing before! This book will give you so many useful tools for social media marketing, I would recommend to anyone who's interested in learning social media marketing and looking to finally get a grip on the Social Media game! I consider myself a beginner who really resists marketing (especially the online kind! ), and even with just getting on board with social media in general. This book, however, did an excellent job of guiding me through the processes. I appreciate that so much! I have to give thanks to both Gary and Michael for an excellent Audio Book. This book is an excellent way to learn how social media actually works so that you can use it in a more secure and more productive way that actually benefits my business in a number of ways- time to implement all the knowledge now! This book was written mainly towards Social Media marketing but anyone in business could use these tips. Simple, easy to read and straight to the point information with great example s.I will buy another one to make it as a gift! Thanks Gary and Michael I love it! This book explains everything to do with Social Media in very simple language. 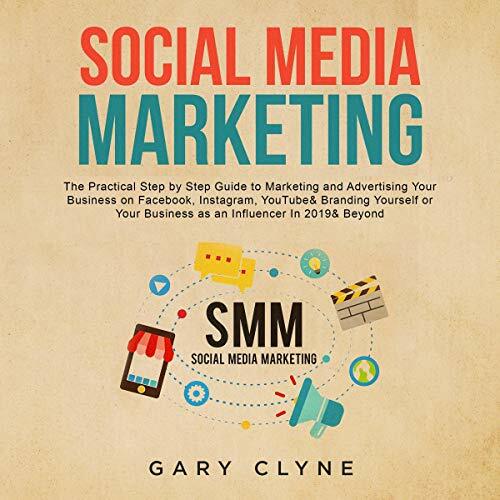 Outstanding book covering all the basics about social media marketing strategies. If you're a small biz owner who didn't have time to master SMM, this book is an excellent start. This book is very informative and explains in detail. Excellent work Gary! I discovered this book both a helpful introduction on SEO and as an essential manual for Facebook advertising. Although I've done SEO in the past it was a great idea to get back up to speed, especially with how fast the online game is always changing! The message is clear and the information is very useful, I was able to put it into practical use right away. I have gained necessary Social Media Marketing knowledge that will help me take my business to the next level and help me finally get more followers and gain more leads through Social Media.